Any work or responses done outside of the hours of operation is at the discretion of the designer. Q. What's your main form of communication? Email (phe.morgan@gmail.com) is my main form of communication. Please allow 1-2 Business days for a reply. Direct messaging on social platforms is acceptable when sharing references and inspiration. Text is for emergencies only. Q. Who is a good fit for your services? Creatives & Entrepreneurs who have a set idea of their vision and know what they want for their brand, as well as small-medium sized companies looking for new direction. Q. What problems do you solve? No more slow turnarounds, unoriginal ideas, and unprofessional interactions. I tackle lack of engagement, stagnant followers, boring designs and unorganized events, head-on! Q. What makes working with you different from the competition? I craft brand identities through fresh, advanced and forward thinking. I pride myself on boosting businesses while remaining true to their mission. Devoted to curating tailored stories through immersive brand experiences, I help businesses navigate the media world. I know how to lead campaigns and generate results. Q. When do you start on projects? Once the deposit is paid and all requested information has been received, then the turn around process begins. Depending on my project load and scope of the project, the turnaround time can range from 1 - 14 days. All deposits are non-refundable. If for any reason at the end of the project you are unsatisfied with your work we can discuss a refund of the remaining balance. I will then decide if and what is fitting for the situation. Q. I don't know where to start, can you help? No worries! We can set up a free consultation call to discuss your needs, goals and current status. From there I can recommend services and next steps. Q. Apart from PayPal, do you take any other forms of payment? Q. Is the artwork our property once paid for? No, not the actual artwork files (.ai, .psd, etc) unless agreed upon and paid for. However, ALL approved web images and high resolution images purchased are 100% yours once the project is fully complete and paid for. Copyright and approved imagery is yours upon receipt of final payment. I do, however, reserve the right to use any work for promotional purposes, all personal information will be modified. 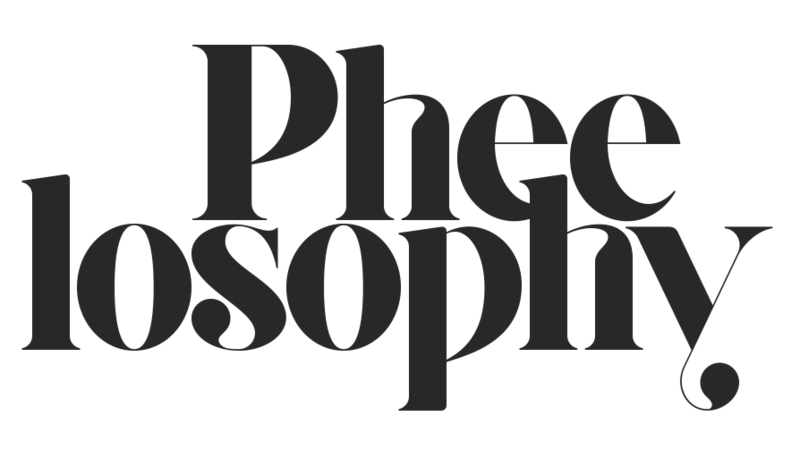 All stock photography used is licensed to Pheelosophy Studios through a stock account. The client has the right to the images to use in marketing. If client relationship is dissolves, those images might have to be repurchased to use with future design firms. Q. I need something designed yesterday, can you help me? We can usually accommodate your rush job depending on how full my project schedule is however, a rush fee may be added. Q. Do you design logos? I no longer provide this service. Q. Do you provide web design services? On a very limited basis, depending on availability and scope of project. Q. What is the client's involvement throughout the design process? As a non-agency, I listen to my clients from the start. I encourage the client to bring in any samples, color combinations/swatches, and ideas they may have to help us get an idea of style before starting to work with new clients. During the design process, the client is asked to approve certain colors and fonts before work continues. Once the design project is ready I will submit a final proof for the customer’s approval. At the conclusion of a project, the client may request the artwork in various formats if payment was made for design services. Q. What's the turnaround time for design work? Turnaround time depends on the designer's current project load and scope of your project. Times and deadlines will be discussed a the start of the project. Q. How will I receive my design project once it's finished? A finished project is yours upon receipt of final payment. I will then supply the electronic files to you via email, google drive or in certain situations, text. We also keep a copy of your project on file for later updates or should you lose your copy. Q. I need my graphics, invitations, materials, (etc.) printed, can you do that? Yes, but please keep in mind there will be an additional charge for shipping, materials and printing services. Once the design project is ready for print I will submit a final proof for the customer’s approval before submitting to production. Once a job is in production, the job cannot be cancelled. Q. What qualifications do you hold? I am dedicated to staying up to date on the latest social marketing trends and updates. Continuing education is essential. Q. What tools and sofware do you use? Depending on you brand's needs I utilize tools such as Hootsuite, Sprout Social, Planoly, Bitly, Google Analytics, Buffer, Later, BuzzSumo and many more! Q. Can you increase leads for my business? I sure can. My expertise in social media allows me to not only find your target audience, but drive them to you website or store front on a consistent basis. From there it's all in your hands! Q. How soon can you start posting on my social media platform(s)? I can start posting on your social media platform 7-15 days from the time you get in contact with us, submit payment and provide requested information. Creating a social media strategy is essential prior to posting cycle. Q. Why do I need an advertising budget? Though an advertising budget is not needed, it is highly suggested. An advertising budget allows me to quickly leverage the data that Facebook, Twitter, and Google has on your target audience, reach thousands of people, grow your following and dramatically increase your awareness and sales for a very low cost. Without advertising, this process will take months. With advertising, the process takes hours. Q. Do you do any charity work? Q. What platforms should I be on? There is no universal right answer for this question. Let’s start a conversation around your unique business and your unique needs to determine what platforms will be most effective to accomplish your goals. Q. Can you setup my social media accounts for me? Not a problem! As soon as your campaign starts, I will create, design and optimize all of your accounts for massive awareness and lead generation. Q. Can you increase my awareness? Definitely. Every day I improve the social accounts of businesses like yours and connect them with hundreds of thousands of people most likely to buy. Q. How much does your services cost? No two businesses are exactly the same and my prices and process reflects that. I develop and execute a unique strategy for your success. Nobody can guarantee results in digital marketing as there are too many variables. Q. Can you grow my email marketing list organically? One of the most basic ways to grow your list is to create an offer (a piece of content that lives behind a form), and ask for people to give you their email address to access that piece of content. This is just one way to grow your list, but it demonstrates the basic principle behind organic contact database growth. Q. Do you send reports? Yes, I provide basic monthly reports that include, progress, recommendations and analysis. If this is not enough, I do offer a service that provides a more comprehensive/ deep dive into your numbers. Q. How will you report and how do we know what you'll be working on? I like to keep our clients up-to-date. I send monthly reports outlining performance, as well as work completed and upcoming work. In addition, I will also show you how to use analytics and set up appropriate dashboards so you can keep track of performance yourself. I also provide action lists detailing all the areas we believe need working on, with appropriate due dates. If that isn’t enough, I also will be in regular contact and if possible will spend time in your office working alongside you. Q. Is hiring an Event Planner worth it? Absolutely! Many people assume that hiring an event planner means wasted money, but I pride itself on providing quality service in events. By having me there by your side to manage all the details of your events, it will save you time, stress and money in the long run. Q. How many hours are you on site the day of the event? On the day of the event I will arrive as early as needed to set up all items, ensure I meet the very first vendor delivering or setting up to the last, and will stay after the last guest leaves to ensure all clean up has been taken care of and vendors items are squared away for pickup. A couple weeks prior to your event, you will get an in-depth timeline which will outline what time we will be arriving. Of course. An event consultant acts as a team member and confidant to assist you in planning the perfect event. In your initial meeting, you can communicate the level of participation you wish to have in the process. Q. When is it too late to hire a day of coordinator? It is never too late for me to be your day of coordinator as long as I have the availability! Q. Many event planners only work with exclusive vendors. If I hire you, does that mean that I can’t use the ideas and vendors that I already had in mind? While I have a list of esteemed vendors, I have no problem with working with the ones that you already have in mind. Q. For the day of the event, will you be willing to oversee the entire event by supervising vendors, troubleshooting emergencies, and soothing nerves? Absolutely! My job is to allow you to relax on that day. I will serve as a liaison between you and vendors and handle all the details of making your event run smoothly. I am calm, flexible and roll with the punches. Q. What are some general tips or advice that you often give to your clients to help them in their planning? Q. What type of events do you specialize in planning? I specialize in the planning of company, non-profit and social events. This includes holiday parties, conferences, workshops, pop-ups, employee appreciation events, fundraisers, galas, weddings, birthday parties, bridal showers and more! Whether you are planning a small gathering of 10 people or the social event of the season with hundreds of people, I have fresh and creative approach to bring your dreams to a reality. Q. Do you charge separately for your various event services? Some of my services come standard, others are priced separately. In order to get an idea of what your event will cost, contact me to speak and get a free estimate based on your individual needs. I'm always on a hunt for New Challenges, Clients & Collabs. NO SPAM GUARANTEE, I hate it too.